HighRise are developing a collection of ideas and conversations around UK Drill music; Exploring its truths, its perceptions and why it has caused a frenzy in the media, in politics and most importantly in the street. Working with experts and young people in the same room, the centre piece to the #UKDrillProject is a new piece of issue based theatre that explores the relationship between musicality and criminality. With headlines & the court putting UK Drill music on the suspect stand, can we as a society really blame an art form for a spike in violence or is that a basic and detrimental way of thinking? 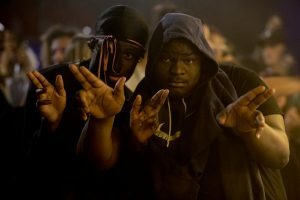 Recently a rap group were charged for breaking a Criminal Behaviour Order, which prohibited them from performing or uploading certain material as it was deemed to insight violence. Performing the song on the last leg of a UK tour, the group were then slapped with a 9 month suspended sentence. Neither men had been convicted criminally before. They both now have criminal records for essentially creating art. This new production asks how this has been allowed to happen. It will challenge perception, highlight injustices and lyrically combat through an important conversation. Following a sharing of the work at The Place on 5-6 April 2019 (Details released soon) the production will go on to a full touring production later in 2019. With further support from The Welcome Trust, The Barbican Lab, The Roundhouse, The Place & Camden Peoples Theatre.